I know there are skeptics out there. I was one. This chocolate recipe, coated in a browned butter sauce with crispy bacon and sweet peas, is simply beautiful and delicious! It’s the perfect recipe for Valentine’s Day. My hubby and I love to cook together. One of our favorite things to do together is to make homemade pasta. This recipe would be such a wonderful surprise for your significant other or a fabulous thing to do together. 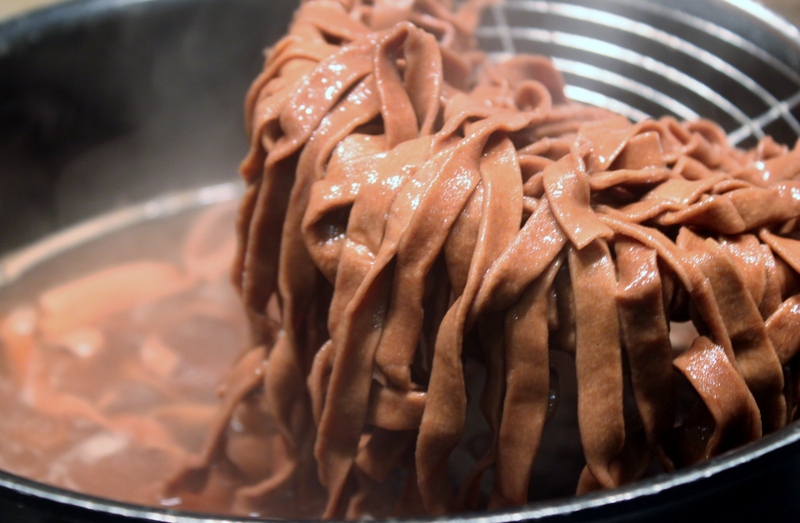 I first recently saw Giada DeLaurentis make homemade chocolate fettuccini and just HAD TO try making it myself. This recipe is adapted to our family’s taste. 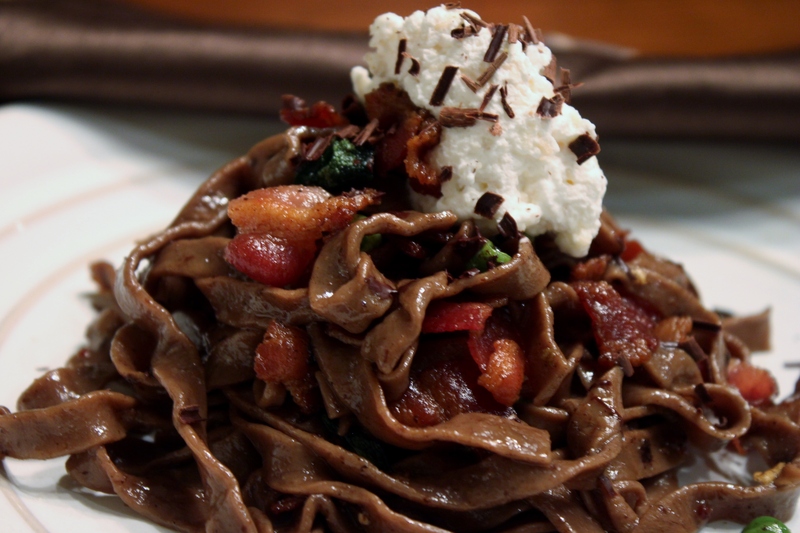 I used bacon in place of pancetta and instead of topping my chocolate fettuccini with marscapone cheese like Giada had I made a whipped cream with three Italian cheeses folded in for the top. How much is that chocolate fettuccini? 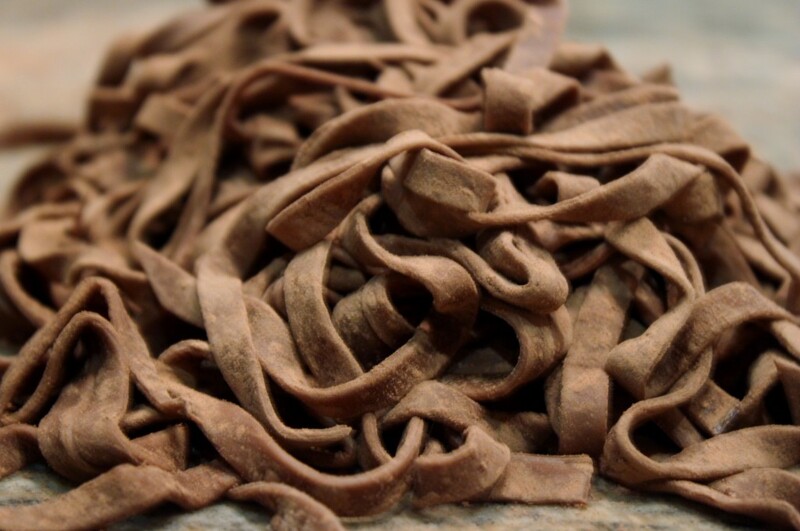 Already-made chocolate fettuccini is very expensive. It can also be difficult to find. All you need are basic ingredients already found in your pantry. Once you see how easy and fun it is to make you and your significant other will pass on the store-bought kind. 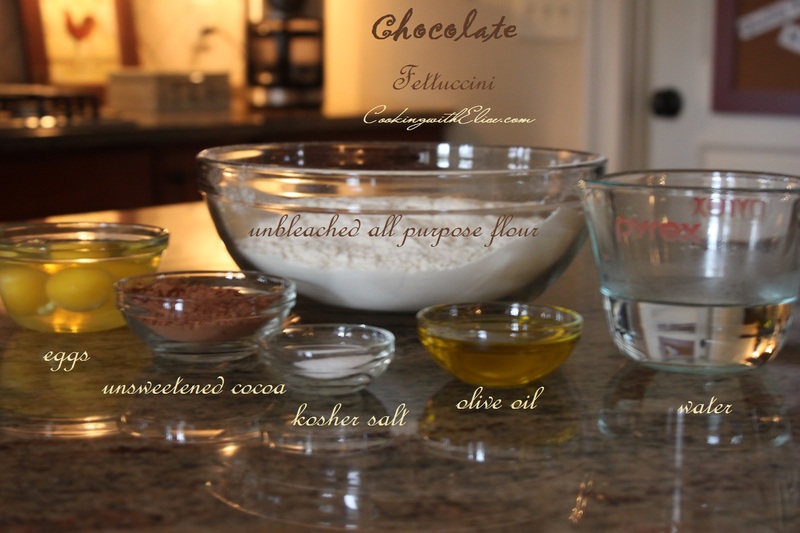 Place the all-purpose flour, cocoa powder, and salt in a food processor. Pulse to combine. With the machine running, add your eggs, gradually add the oil and then water until the mixture forms a dough (the dough should stick together if pinched between your fingers). If necessary, add additional water, 1 teaspoon at a time if the dough is too dry. (Remember: you can always add, but you can’t take away). 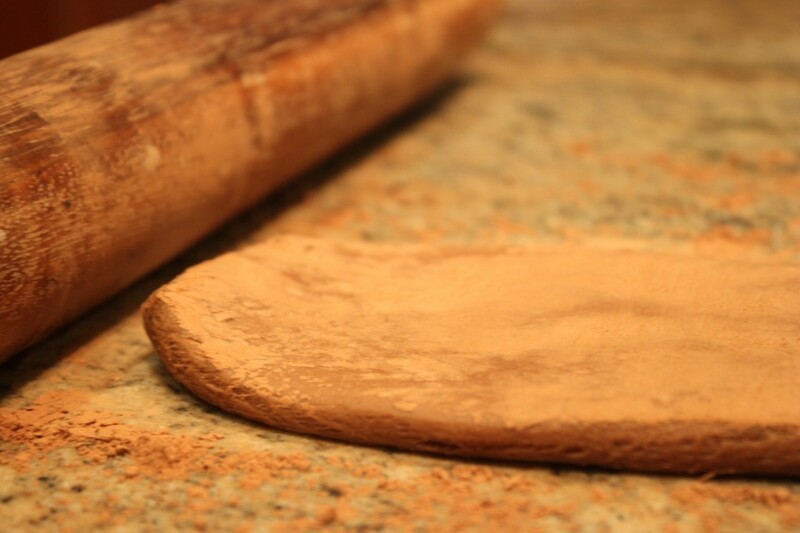 Place the dough on a lightly floured surface (use extra cocoa powder). 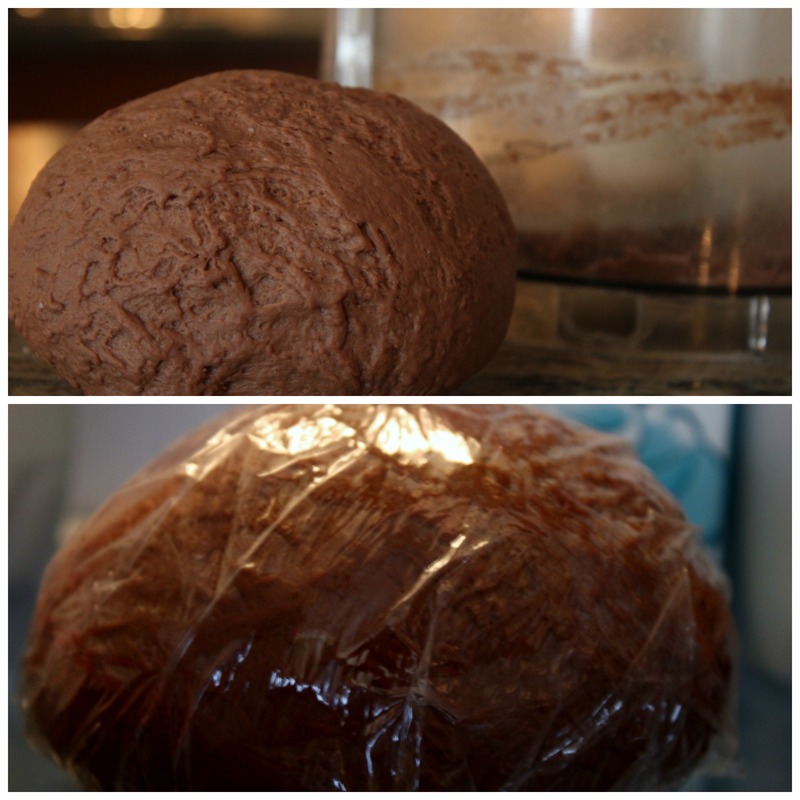 Gather the dough into a ball and knead until the dough is smooth, about 5 minutes. Cover it well with plastic wrap and refrigerate for 30 minutes. and press or roll flat. 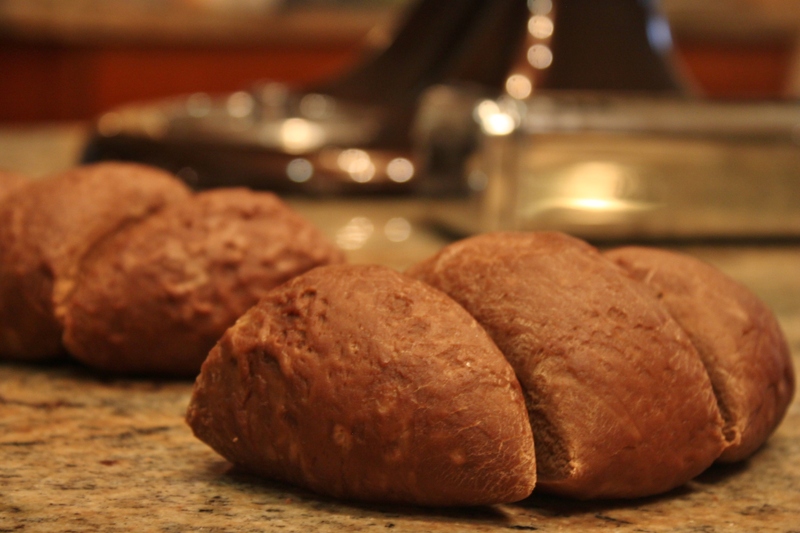 Dusting the pasta dough with a little unsweetened cocoa powder prevents it from sticking to your machine. Run each piece of pasta dough several times through a pasta-rolling machine adjusting the setting each time until the pasta is about 1/8 to 1/16-inch thick. Cut the pasta into fettuccini noodles. Pour 1/2 cup of heavy cream into a small bowl. Beat until lightly whipped and fold in freshly grated Parmesan cheese and set aside in the refrigerator. 2. Bring a large pot of salted water to boil over high heat. Place large nonstick skillet over medium-high heat. Add the diced bacon to the pan and cook, stirring frequently, until golden and crisp, about 6 to 8 minutes. 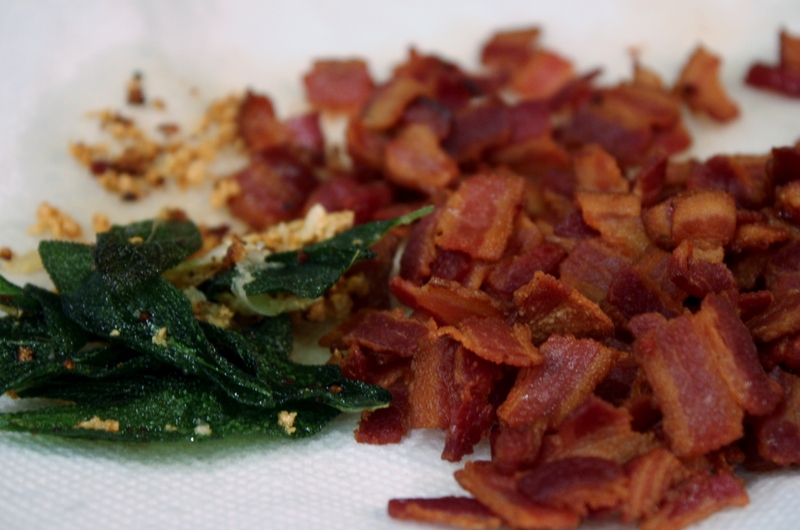 Using a slotted spoon, remove the bacon and drain on a towel-lined plate. Add the butter and stir over medium heat until melted. Reduce the heat and simmer until frothy. Continue to cook until the butter has a nutty aroma and turns a caramel color, about 3 minutes. 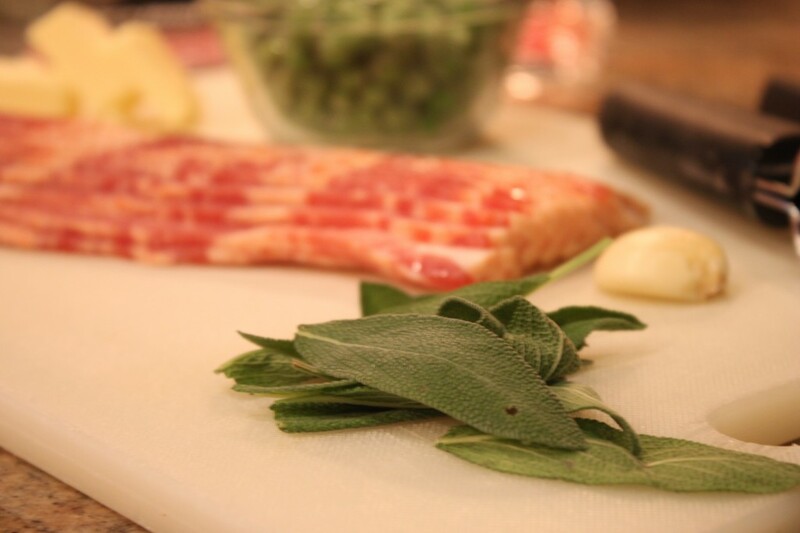 Add the garlic and the sage leaves and cook until they are browned and toasted, about 2 minutes. Remove the fried sage and garlic to a paper towel-lined plate. Everything I need to make my brown butter sauce. Keep the pan over low heat and stir in the peas and cook them until they are warmed through, about 2 minutes. 3. Meanwhile, add the pasta to the boiling water and cook until tender but firm to the bite, stirring occasionally, about 2 to 3 minutes. 4. Drain the pasta. Add the pasta and crispy bacon to the skillet and gently toss to coat with the browned butter and peas. 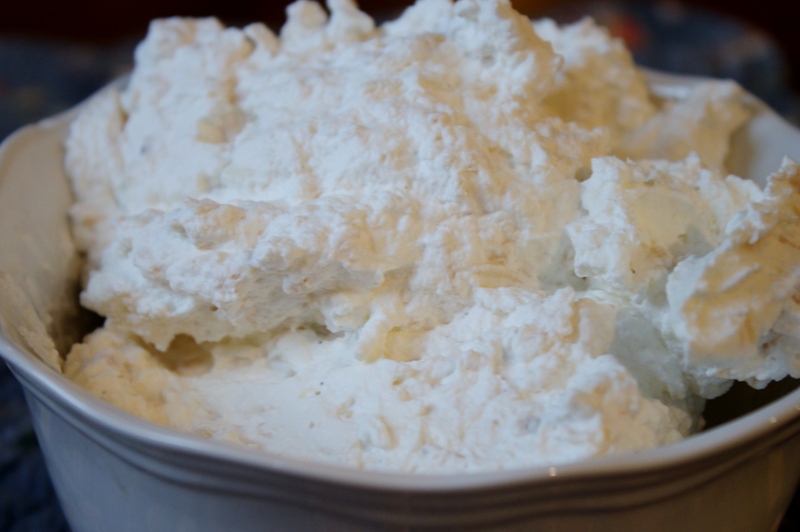 To serve, add a dollop of your whipped Parmesan cream. 5. 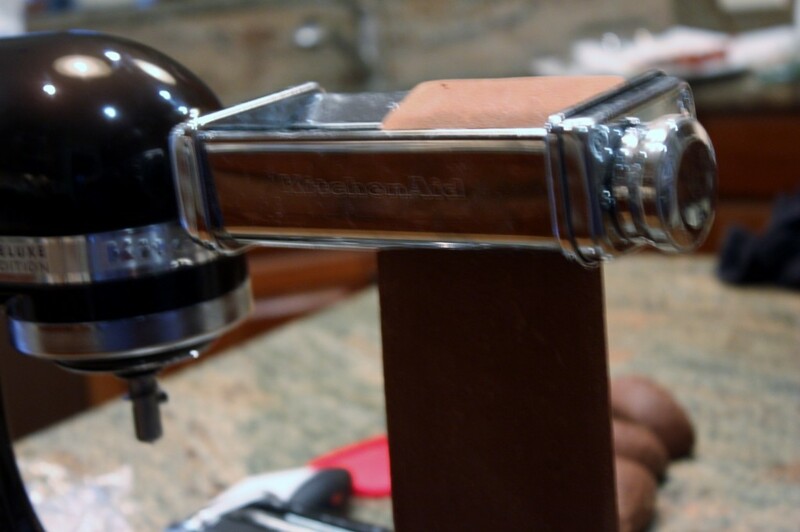 Garnish: Using a vegetable peeler, carefully run the peeler over the dark chocolate. 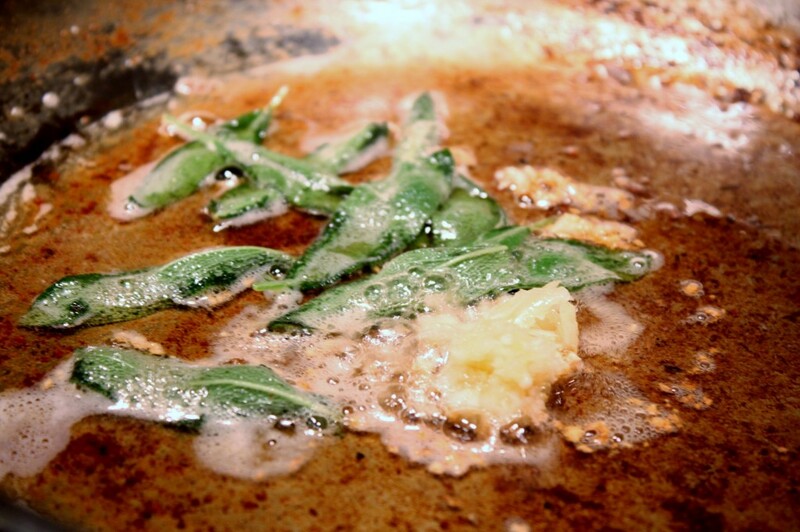 Sprinkle over the pasta along with a few fried sage leaves. 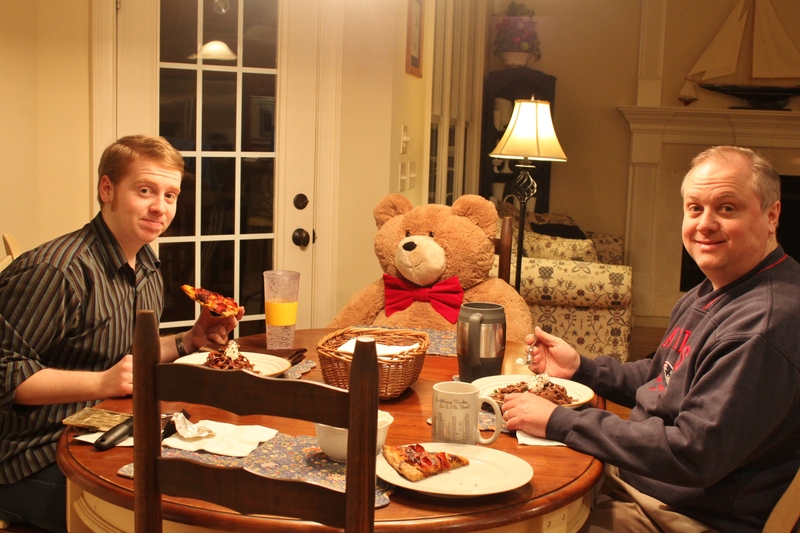 Wishing you all a very, Happy Valentine’s Day filled with wonderful memories, tasty, food. lots of love and tons of affection! Speaking of Valentine’s Day, this not-so-little cutie pie arrived at my door today! It’s an early gift from my hubby! Here’s a fun TV segment with my friend Cindy Farmer over at Fox 8! We got caught up in the moment. We thought we were Demi Moore and Patrick Swayze in Ghost! Instead of working with clay we were working with pasta dough.